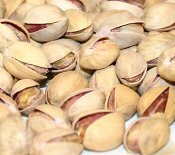 Pistachios to pecans - nuts such as these are great for many types of dessert but they are especially good in ice cream..
*blanched = if you have time, then blanching can help the recipe; place the nuts in a heatproof bowl and pour boiling water over them. After 1-2 minutes, carefully drain and peel. Ensure you dispose of the hot water safely. Method: In a blender place the eggs, milk, sugar and all the nuts and blend until you get a smooth mixture. Pour the mixture into a saucepan and heat gently, stirring continuously and wait until it thickens. IMPORTANT: DO NOT BRING TO THE BOIL OR IT WILL PROBABLY CURDLE.